When I first purchased the Amadeal XJ12-300 milling machine I decided that what I need was some direct collets. The head on this mill is 3MT and the drawbar that comes with it is 12mm metric. Having searched around the different tool sites I decided to buy these from Arc Euro Trade. I ordered their selection of 4 sizes (6, 10, 12 & 16mm). After two days I received a phone call to say that they did not have the 16mm collet and so asked if this could be replaced by the 5mm collet – they were happy to do this and still give me the deal. The collets turned up individually packaged and greased. Not long before I cleaned them up and put them to use. The difference is huge as the chatter is reduced dramatically and you can increase the size of the cut. 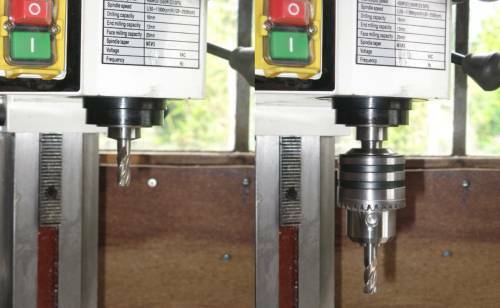 The advantage of the direct collet is obvious in the above pair of images as the distance from the end of the mill to the bearing in the head of the milling machine is much greater with the drill chuck. The advantage with the milling machine is you get much less chatter as a result of this reduced overhang. In addition the chuck only holds the mill at three points whereas the collet holds the mill around it’s circumference. 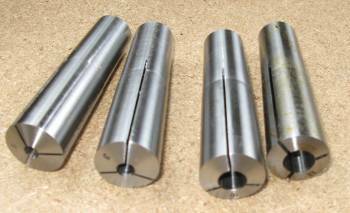 Cannot recommend direct collets enough for the milling machine – they are a transformation. Also, dealing with Arc Euro Trade was a good experience.